Some players in the building industry on Monday advised Lagos State Government to seal and demolish all distressed buildings in the state to avert building collapse. The experts, who gave the advice in interviews with the News Agency of Nigeria (NAN) in Lagos, said that the government’s agency responsible for monitoring buildings should be more proactive. NAN reports that two people were confirmed dead on Feb. 2, when an abandoned three-storey building collapsed in Ijora Badia area of Lagos State. The abandoned building, located at No. 9, Amosun St., Ijora, Badia, was occupied by three persons, suspected to be illegal occupants, as the original residents were said to have vacated the building long ago. Two of the occupants were brought out dead, while one was rescued with injuries. Mr Kunle Awobodu, National President, Building Collapse Prevention Guild, said that building collapse resulted from negligence of the monitoring agency. Awobodu said that the legal occupants of the building vacated and abandoned the building about eight years ago due to signs of defect. According to him, an agency of the government charged with building monitoring should have sealed or demolished the building, thereby prevent it from hiding miscreants and illegal occupants. “For the original occupants to have abandoned the building for over eight years, means it is structurally defective. “This is a period long enough for the monitoring agency to either demolish the building or persuade the owners to renovate it. “Once a building is abandoned, it begins to show signs of defection, which will eventually lead to collapse,” Awobodu said. Mr Makinde Ogunleye, a former Chairman, Nigerian Institute of Town Planners (NITP), advised the government to formulate a policy stipulating that buildings abandoned for long would be confiscated by the government. Ogunleye regretted increased rate of building abandonment across Nigeria, saying that the policy would curb the trend. According to him, once a building is abandoned for about six years, it should be confiscated by government and converted to a meaningful project in public interest. He advised Lagos residents to report construction of abandoned and substandard buildings to regulatory or monitoring agencies. 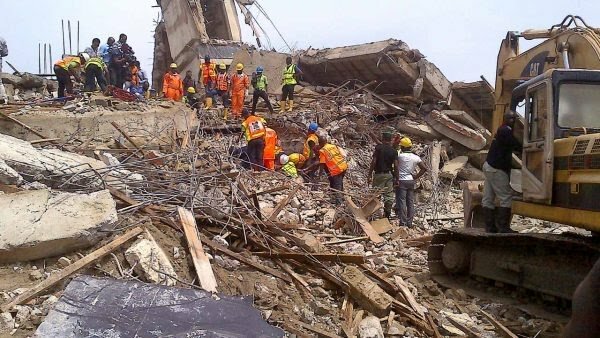 Ogunleye said that such a report could be made to the Lagos State Building Control Agency (LASBCA) for appropriate actions to avert building collapse. “Residents have vital roles to play in curbing building collapse; they are in a better position to detect illegal, abandoned and substandard constructions early. “LASBCA and other building regulatory authorities alone cannot properly monitor to detect when buildings are defective or when illegal constructions are going on, without the support of residents,” he said. According to the former NITP chief, the residents are in a better position to detect abandoned and substandard buildings within their areas. “It requires collective efforts to end building collapse, and residents need to contribute their quotas,” Ogunleye said.